Back to school is a time of emotional upheaval. Kids are nervous about not being in the same class as their friends, meeting new teachers, learning new things, adjusting to a new environment, leaving the carefree days of summer behind and so on. With a kindergartener and a first grader in my house, this new school year brought lots of fears, angst and of course a touch of excitement. That's a lot of different emotions and feelings for children (and parents) to digest. How do you calm their fears? How can you help relieve their angst? As parents how can we nurture and encourage their excitement? These are all things I was struggling with as a mom. I myself was feeling very emotional about having both my babies in school full time, returning to work and letting go of this chapter of our lives and embracing the next phase we have entered into. 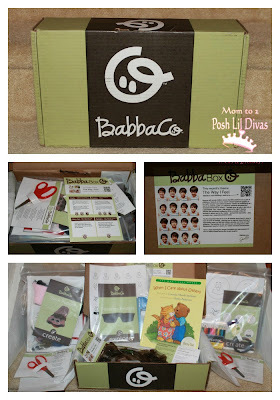 As soon as our BabbaCo box arrived in the mail I knew that it would be perfect to use during back to school time. Why? It was a "The Way I Feel" box so I thought it would provide me with some fun ways to help the Lil Divas express what they were feeling and open up communication amongst all of us. I was really impressed with the contents of the box. It was chock full of goodies and there was so much to do. 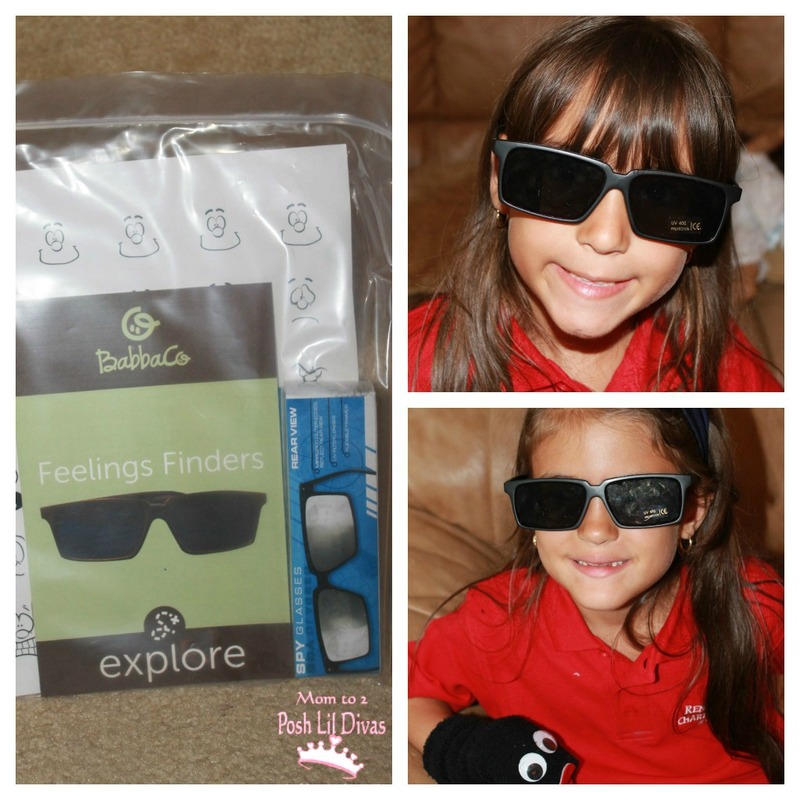 This particular feelings box came with various activities - sock puppets, feelings faces magnets, a feelings book and spy glasses that could be used as feelings finders. On top of all the activities it also included suggestions for digital downloads and more online fun and a bonus parent massager/de-stresser. I honestly couldn't believe how much stuff was in this box. I loved that everything we would need was right there in the box including glue and scissors. All the prep work was done for me. I can't begin to tell you how that came in handy this week when I had zero time to devote to anything except getting prepped for my own classroom's back to school and getting the girls back into a formal school routine after our relaxed summer schedule. The first thing we did was to work on the Feelings Faces Magnets. I wanted to have this ready to use for the first week of school so that the Lil Divas could easily share how they were feeling both before they went to school and once they returned home. It was a great conversation starter and the Lil Divas really got into changing out the faces to match their moods. For example, on the morning of the first day of school our magnet had a nervous face but after a great first day at school they replaced it with a happy face. 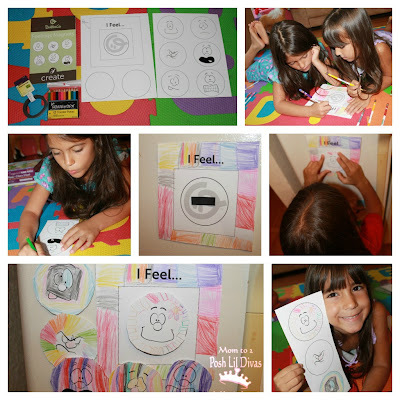 Our Feelings magnets are proudly displayed on our refrigerator and have been getting lots of use this week. The next activity we enjoyed was the enclosed feelings book which the Oldest Diva read to her Little Sister. How it warms my heart to watch them reading like this together. 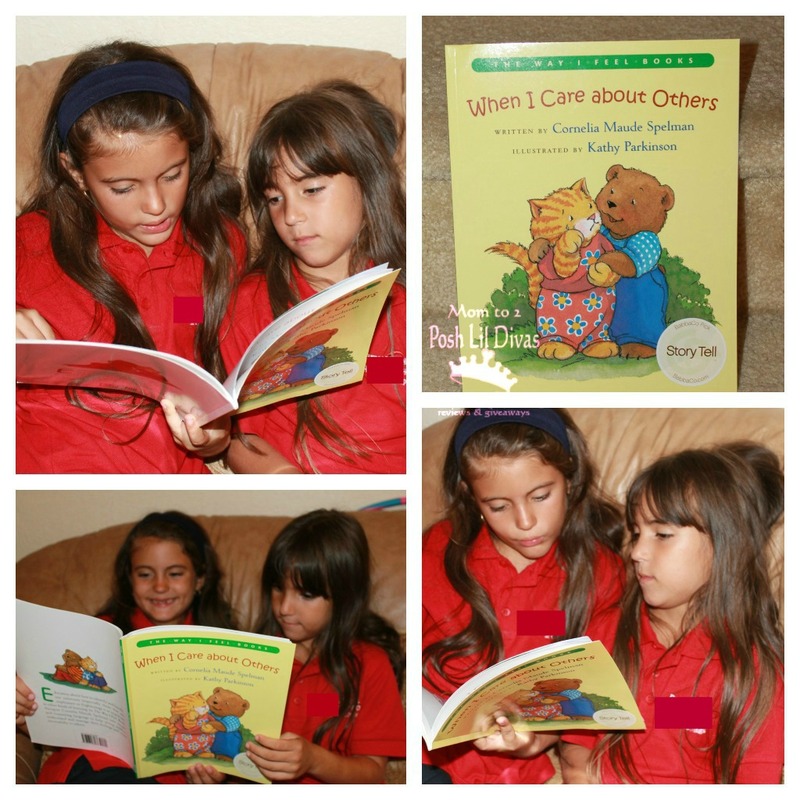 The book is about caring for others and opened up some great dialogue between the Lil Divas and I about the things we can do to show our family and friends we care about them. With both Lil Divas in classrooms where they didn't know anyone, it was nice to take some time to discuss what it means to be a good and caring friend and family member. The story was short, simple and to the point and a great starting point for discussion. Next we explored the sock puppets which I must say was one of their favorite activities from the box. I love that there were 2 socks so that both girls could make their own puppet. 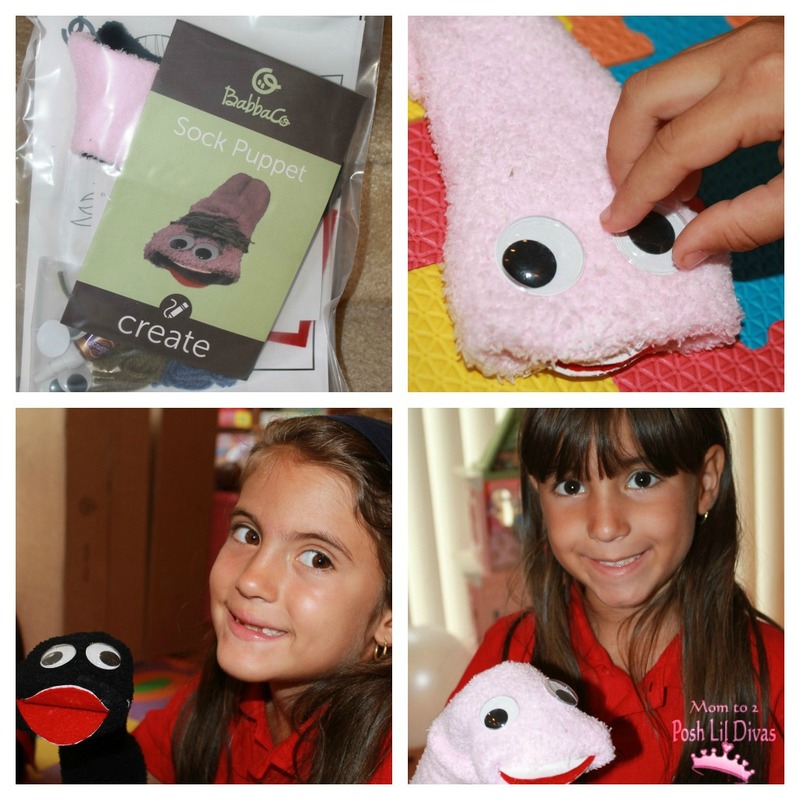 The bag included fuzzy socks, yarn, wiggly eyes, felt, card stock and glue - all that had to be added was imagination. We kept our sock puppet design simple but you can easily add your own craft items and take things up a notch. The Lil Divas used the puppets to role play feelings and play out scenarios. They enjoy putting on shows so this was fun for them and it was nice to go over reactions to feeling scared, being a friend, feeling happy, etc. The hit of the box was the Spy Glasses. These glasses allow you to see behind you from the sides and believe me I wish there had been 2 of them because the girls really enjoyed wearing them and spying on everything going on behind them. As you can imagine - these have been used a lot way beyond the scope of the activity for the box. Isn't this a great box and honestly wasn't it perfect for back to school? I truly enjoyed being able to explore this box with the Lil Divas during their first week of school. BabbaBox is a monthly subscription based box service that is delivered right to your home. The company was started by Jessica Kim - a mom like you and me! You don't know how much I love that. The boxes include all physical materials, directions and suggestions you will need to complete the 2-3 included activities right in the box (including things like glue and scissors). The boxes are designed by experts and are geared for kids ages 3-6 years old. My girls are 5 and 6 years old and our box was great for their age group. TheLil Divas thoroughly enjoyed their BabbaCo box. Subscriptions start at $29.99 a month but I am super excited to be able to offer my readers a special coupon code for 20% off your first box - just use MPD20OFF at checkout. We also have a giveaway sponsored by BabbaCo so that one lucky reader can try out a box firsthand. Yay! I know my readers will enjoy a BabbaBox so I am excited to be able to introduce you to this great company and their service. Disclosure: This is a sponsored post. I received a complimentary BabbaBox to facilitate my review of BabbaCo's monthly subscription service and compensation for my review. ALL opinions expressed are 100% my own and based on our personal experience with the box we received and its contents. Your thoughts and opinions may differ from ours. I'd love this for my little one. I would like to win it for my son. He is 3 and we just started discussing feelings. Thanks for the comprehensive post on the BabbaCo Box. I've been thinking of getting this for Little A and it's nice to get some personable insight into it. My little guy will be 3 in a few months, and I have been looking for something just like this. I used a similar service when my now 18 year old was of preschool age, and it is no longer available. How exciting to find this! I would love to win one for my niece!! I would love something like this. I am a working mom and my husband stays home with our kids. He's lots of fun, but the crafty activities are my domain. This would help him engage our nearly 3 yr old in more preschool appropriate activities. I would love to win ths for my Boys!! I would love to win this for my Boy! Looks like a great way to play and learn! My kids would adore this, but it would be great for friend dates too. I'd love this for my two littles. For my almost 4 year old daughter. I would love to win for my son, he would love the feeling box. I would love to win for my three boys. They are 2 1/2, 6 1/2, and 8. They would all love this! We do a TON of arts and crafts projects, so it'd be perfect for our home.